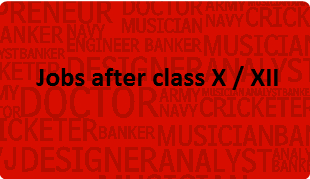 Some students may be interested in getting jobs after class 12th / jobs after class X. Here we have listed the various exams and other options which can lead to jobs after class 12th. The options have been categorized on the basis of exam conducting authority. The students can get more information about these options from the respective institution’s website. Eligibility: Unmarried male for Naval & Air Force wing of NDA & Naval Academy 12th with Phy. & Maths For Army wing - 12th with any stream. Age16½ to 19 yrs. as on 1st Jan. or 1st of July. Eligibility: Class 12th with Math & Phy. / Chem. as a subject with 1st/2nd Div. Age: 16 yrs. - 26 yrs. Examination conducted by Staff Selection Commission for Matric Level Posts. 2. Main Examination for Matric level posts: LDC Paper 1: Part A- General English - 50 marks Part B- General Studies - English/Hindi 100 Part C- Arthmetic (Eng./Hindi) - 50 Duration : 2 hours. Skilled test- Typing test at the prescribed speed after clearing main exams. 3. Stenographer Grade 'D" Paper 1- Part A- General studies - 100 Part B- Language Hindi/Eng. (comprehensive on - 100) 2 hours test. Shorthand test in Hindi/Eng. - 300 marks after qualifying main exam. Eligibility: 10+2 Basic Knowledge of Computers. 18 - 27 yrs. Eligibility: XII with60% marks 18-28 yrs. Written Exam objective type. Reasoning Ability Clerical Attitude, Numerical Ability, English Language, Descriptive Test - Short essay or exposition on given situation. Eligibility: X 18-23 yrs For SC/ST 5 yrs. Relaxation Physical efficiency test, Interview, Sportsmen, Ht. min. 157 cm & well built. Eligibility: X 18-22 yrs For SC/ST 5 yrs. Relaxation Min. Height 170 cm. (Waived for candidate of hilly area i.e. 165 cm., Fort ST 162-5 cm. Eligibility: XII with PCM (min 70%) 16½-19½ SSB No Written Test. Eligibility: X with 50% marks 17-20 yrs. a) Written Exam: English lang., Comprehension including Maths b) Gen. knowledge & gen. sci. c) Sports trial in case of outstanding sportsman. Airmen in Non Tech. Trades a) For all non Technical Trades except mechanical transport driver. XII with PCM 16-19 yrs. Written Test: English, Intelligence, G.K. Eligibility: XII, Age: 18-25 yrs. PC BM at XII girls - 160 cm height Boys - 163 cm.